It is the most anticipated political event in Russia. It drives its elites and its respective clans nuts. World leaders are watching it closely. Bets are being placed on it, and financial wizards have even devised complex financial instruments that are linked to its outcome. I am talking, of course, about the decision that Prime Minister Vladimir Putin and President Dmitry Medvedev will make between themselves about which tandem member might run for president in 2012. Nothing will have more impact on the future trajectory of the country than this single decision. As the anticipation builds, some have urged the tandem to resolve the matter sooner rather than later, arguing that further delay could sink the Russian ship. Some, like political analysts Gleb Pavlovsky and Igor Yurgens, have urged Medvedev to pre-empt Putin by unilaterally deciding to run for a second presidential term. It may, however, be too late. Perhaps the decision was already made in late 2007, when Putin and Medvedev agreed to create the tandem in the first place. Most likely, Medvedev from the beginning was only held in reserve in case there was a dramatic change of circumstances precluding Putin’s return to the Kremlin. If the decision was already made in 2007, it would make Medvedev’s timidity regarding his presidential prospects understandable. This would explain his reluctance during his four years in office to build his own political base, including a political party to nominate him for president, although credible options certainly have existed. Medvedev has also not built a powerful political operation to run his second presidential campaign, even though there was no shortage of volunteers (not counting “The Medvedev Girls”). Assuming that Medvedev was only a fallback candidate, he chose the right strategy — one that never envisioned an independent run but pursued a distant hope that Putin, closer to 2012, would for some reason change his mind about running himself. Much more intriguing now is whether a historic decision in 2007 also pre-programmed Medvedev’s future after 2012. This had to be the case; otherwise any deal would be overly one-sided. The real question is how the 2012 decision will be announced publicly. Medvedev cannot say he won’t run for a second term because he is tired. Nor can he simply depart for a professorship at Skolkovo. This would undermine the institution of the presidency. There has to be a credible explanation and a plan for Medvedev’s future, but almost all options are bad. The only option that would retain political plausibility and human decency would be a complete rotation of the tandem — that is, Putin becomes president and appoints Medvedev as prime minister. This would give Medvedev at least six more years to complete his reform and modernization programs. This arrangement may appear offensive to some tastes and may even provoke sneers. But the option that Pavlovsky has promoted — having Medvedev run against Putin, lose the election and turn into a leader of the opposition — would be suicidal for Medvedev, turning him into another Mikhail Kasyanov. 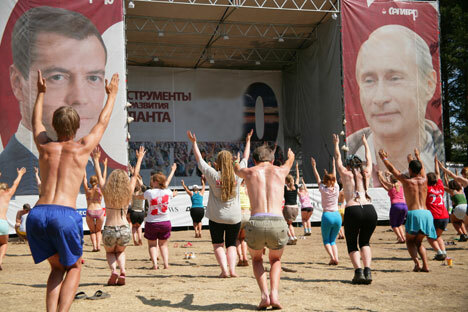 If Putin does run for president in 2012, he should keep Medvedev as a partner in the tandemocracy and retain him as a reformist prime minister.